The 10 Best Ice Skating Rinks in Utah! If you're looking to perfect your twists and turns on the ice (or at least, to learn how to skate without holding onto the boards), Utah offers a vast selection of ice skating rinks that feature a refreshing chill all year. 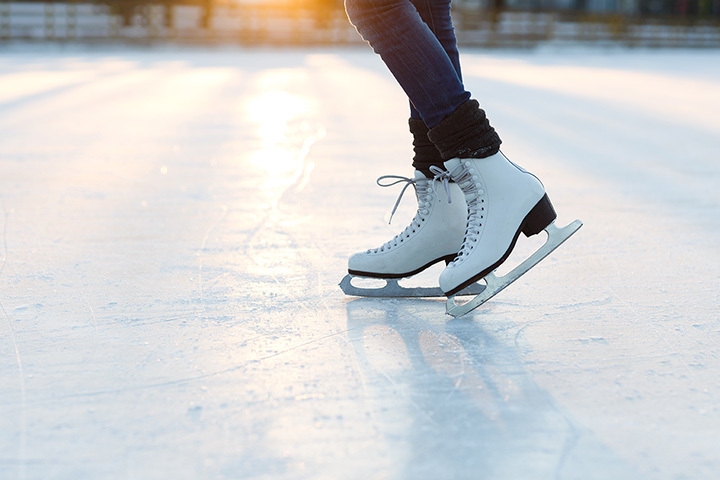 When the ice skating bug bites, these 10 best ice skating rinks in Utah are great places to start. Public skate sessions vary at this popular, indoor Provo ice skating destination, so make sure to check their calendar before heading over. A hotspot for serious ice skaters and hockey players, it is also a busy center for family fun and college students. The fares are cheap and the rinks (which were used during the Winter 2002 Olympics) are of top quality. Another indoor facility, the Park City Ice Arena is an Olympic-sized ice sheet crafted specifically for the sake of fulfilling the Park City community's winter sport needs. The rink offers private lessons, public skate and even summer camps. Park City's only outdoor ice skating rink, this rink is (likewise) only open for the winter months. That said, it's the perfect place to wind down with a hot chocolate after an intense day. Located at the base of Park City Mountain Resort, the romantic mountainside ambience is offset by an array of tasteful Christmas lights. Located in the city of Kearns, the Utah Olympic Oval was expressly built for the 2002 Winter Olympics. Used primarily for speed skating during the Olympics, the oval is now open to the public and offers world-class facilities for ice skating, hockey, speed-skating and curling. All things considered, the Utah Olympic Oval's facilities are undoubtedly some of the best in the nation and an incredible resource for Utah residents as well as tourists. Originally used as a training venue for the 2002 Winter Olympics, this sports complex in Salt Lake City now offers two Olympic-sized ice rinks (along with myriad other athletic facilities) to the public. On some Saturday nights, the ice skating rink does disco night with the lights low and the groovy music loud. The Gallivan Center is arguably the most magical place to ice skate in the state of Utah. Why? Located in downtown SLC and only open for skating during the winter months, this outdoor rink is accented by streaming lights and glittering Christmas trees. Simply put, it's a taste of a New York City Christmas in view of the Rocky Mountains and an experience worthy of the higher price tag. The ice rink at the Cottonwood Heights Recreation Center is family-focused. With relatively stable hours for public skate, it's also a simple and reliable option for those in Salt Lake County. The ice rink at the Cottonwood Heights Recreation Center is family-focused. With relatively stable hours for public skate, it's also a simple and reliable option for those in Salt Lake County. A small outdoor rink located at the heart of Solitude Resort's quaint European style ski "village," this location isn't ideal for rough-housing, but a much cheaper alternative to an international flight to the Swiss Alps. Not far from Park City in Summit County, Midway is one of Utah's lesser-known gems. The outdoor Midway Ice Rink is one of the European-inspired town's highlights, offering small-town vibes and ridiculously scenic views. Unfortunately, Southern Utah doesn't offer much by way of ice rinks. This makes ice skating at Ruby's Inn at Bryce Canyon a real red-rock treat. This rink is so under-wraps that online information is scarce. If you're in the area during the winter months, however, this is a great place to let loose on the ice in an unexpected location. Unfortunately, Southern Utah doesn't offer much by way of ice rinks. This makes ice skating at Ruby's Inn at Bryce Canyon a real red-rock treat. This rink is so under-wraps that online information is scarce. If you're in the area during the winter months, however, this is a great place to let loose on the ice in an unexpected location. View more Utah Ice Skating Rinks.